I recently updated my UI compilation for 5.4! You can download it from WoWInterface if you’re interested. I made a lot of minor changes here and there, but all of the core addons remain consistent with the previous version from last year. I moved the primary action bars up a bit to make monitoring the cooldowns a little easier. Depending on what version of my UI you may be using, I’ve gone to Weak Auras now instead of Power Auras. I moved the big cooldown buff group down by my action bar. Since Readiness has been removed, it’s now only used for Stampede. I removed the borders from my KG Panels. They’re now just simple translucent panes. There might be a few other little tweaks I did, but nothing big. If I think of anything else worth noting, I’ll update this post. Those of you who installed this and then headed into Strand of the Ancients may have been a little frustrated. Seems the vehicle bar was inactive, and I also had neglected to add in the new action bar which houses the bomb button. I’ve not been on much since they changed the bomb mechanic in SotA, plus it’s been one of the BGs I’d blocked from my queue list, so I hadn’t noticed this problem until recently. Select Extra Action Bar and check Enabled. Select Vehicle Bar and check Enabled. Resize and reposition both as desired. Enable Extra Action Bar and the Vehicle Bar and you’re set! 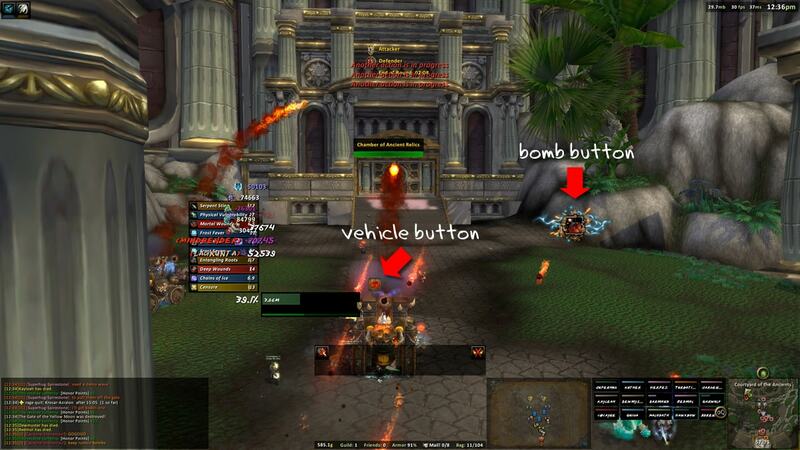 UI updated with additional vehicle and bomb action bars. I’ll re-upload a version with this fix in it, but I’m going to bang away on this UI for a few more days to make sure there aren’t any other glitches. It’s been awhile since I’ve been really active, so I want to make sure there aren’t any other kooky issues I may have missed. 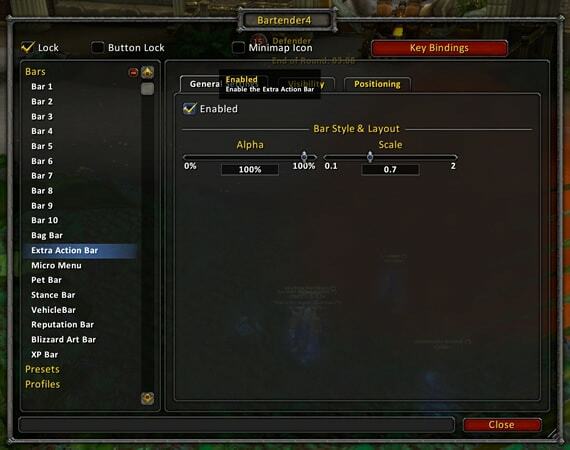 The biggest change is probably the addition of Capping – a BG timer mod. It also adds some additional skinning abilities to the zone minimap – which I took advantage of. My UI is now configured to display a perfectly scaled zone minimap – in the space where Omen lives – whenever you’re in a battleground. 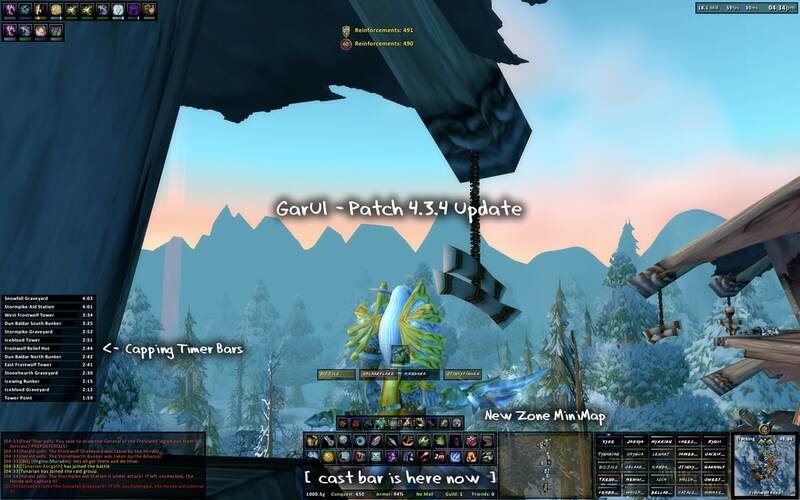 Apart from that, I adjusted the positioning of the action bars and cast bar. I bumped the action bars up a bit, so they’re a tad closer to the unit frames, and I moved the cast bar down and made it larger. It’s a subtle change, but I like it. The updated UI pack is available now, so head over to WoWInterface to get it. I know it’s been a patch or three since I last posted an update to this, and for that I apologize. You have to understand, however, getting a UI compilation prepared and ready for download is serious business — something I seldom have the time for. There may be little quirks and things that I can live with, fix later, etc… but when I make the decision to actually post it online, s**t has to be near-perfect. Because I have to work for a living, I must make decisions on how to spend my ‘off-time’, resulting in things like UI updates getting placed on the back burner. Having said that… those of you eager to try out my user interface will be pleased to know that I have spent the past two days hard at work, trying to iron out the final few kinks. 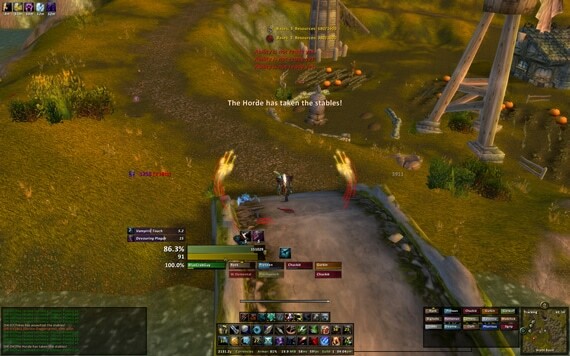 This involved a full audit of my custom interface, i.e., reassessing all of the addons – making sure that all of them were current and still being developed – or finding better alternatives, as well as finishing up the little customization odds and ends that have been needed prior to this update. I also plan to update all of my Hunter Power Auras this week. I’ll have those posted here on the site. Sorry for disappearing from the site for several days, but as some of you may have experienced… I tend to do this on occasion when the RL starts to overwhelm and monopolize my time. I had become buried with work projects, not to mention preparing for a 9 day, 2.3K mile road trip vacation which I just returned home from yesterday. I’d meant to post a note about my absence, but I was even too busy for that! It seems the natives are getting restless, so I figured an update on my UI compilation was in order. I’m almost done with a 4.0.1 compatible version… almost.